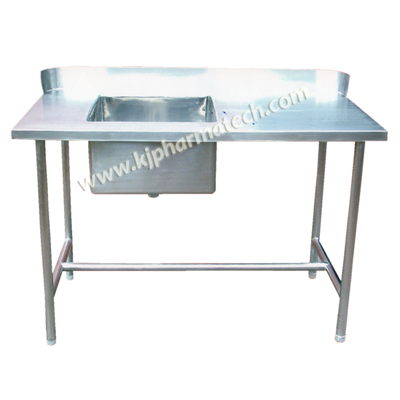 We are the leading manufacturers of premium quality SS wash basin sink unit and this assortment of our products is accessible in diverse Overall Sizes and Bowl Sizes. These are designed to for better functionality and easy maintenance. We fabricate them in exclusive designs with excellent finishing to offer glossy and elegant look. We produce them with the aid of technologically advanced methods and high quality SS material in accordance to standards followed internationally. Hence these are absolutely strong with good impact resistance as well as have high resistance to corrosion, rust and wear &tear. These also have excellent scratch resistance.We moreover quality test them to ascertain they are totally flawless and offer highly durable life. We offer these at excellent prices and are the chief providers of the Clean Room Furniture in Ahmedabad.